This early Spring has thrown me for a loop. I haven't even put a wreath on the front door yet, and Easter is just 3 days away! 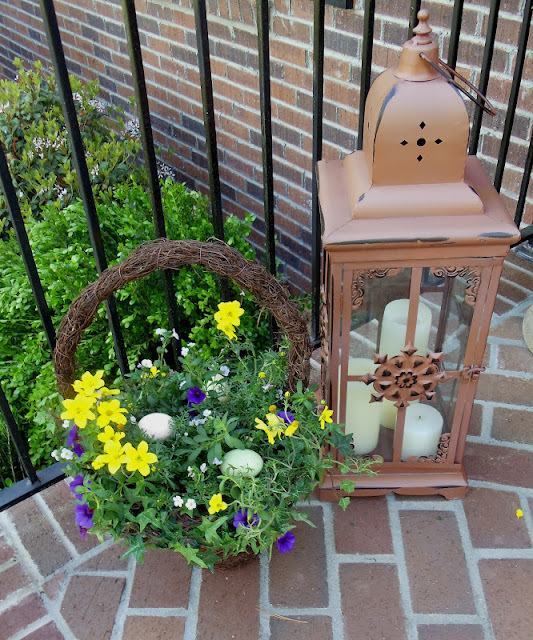 So, I quickly made two flower baskets...one for the front steps and the other for the deck. Now I have a welcome basket by the front door. You probably noticed I haven't painted my lantern yet. Did I say I was far behind with decorating? At least I managed to put candles in it. 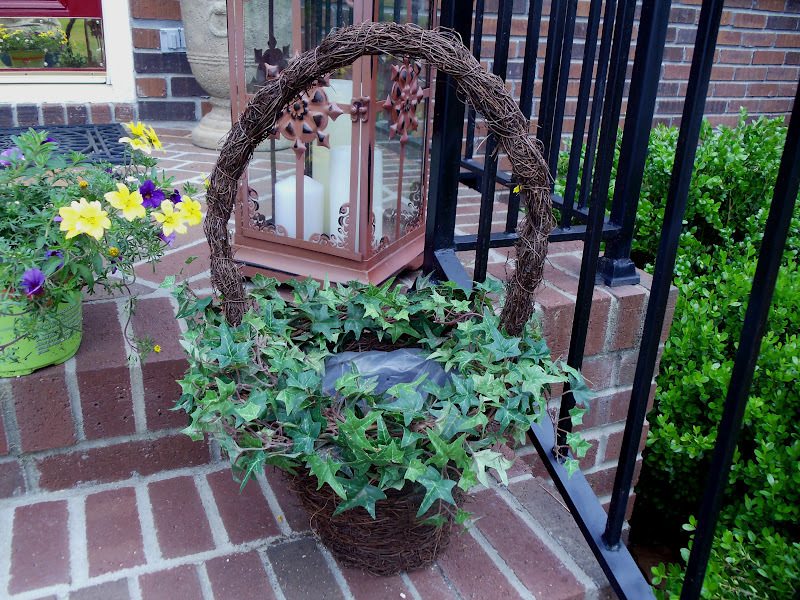 ...quick, easy and the only cost for both was the mixed pot for the front steps basket. Both baskets only took me about 10 minutes to make...total...quick as a bunny. I hope y'all are ready for Easter. I haven't done a tablescape, because we'll be going to my aunt's house for Easter dinner and pigging out with all the cousins. I am sooo ready for potato salad, deviled eggs, ham, home made pound cake...and all the trimmngs. Babs, it all happened too quickly. We went from a very mild winter straight into summer. I haven't had time to do anything on the porch either. Your fresh Easter basket is just gorgeous! I am definitely going to give this a try, it looks just so welcoming! After having summer-like temps in March we're expecting a freeze tonight! I love your beautiful baskets. They look so beautiful for Easter and spring. Happy Easter to you! The basket of flowers on your porch is beautiful...love how you thought to put the ivy wreath on it! Good thinking on the deck basket...use what you have! I am at a loss where the time goes. Although it's still too iffy for us to plant flowers, our trees and bushes have all budded out and it's feeling like summer is just around the corner! I hope you have a wonderful Easter at your Aunt's! I really love how your basket with the handle turned out! I love the Easter eggs you added. Adorable! The hanging basket is wonderful too. Love that color combination. I haven't done any flowers outside yet. I'm waiting on my husband (as usual) to take me flower shopping. He gets a discount at the nurseries since he has a lawn business on the side. That is one of the things I have planned soon. Hope you have a lovely Easter with your family. Both of your arrangements are great, but I really love that basket.No one would ever know how easy these were if you didn't tell. Happy Easter. Don't be fooled about spring...we were up in the high 80's last week, today it barely got to 60° and is supposed get down into the low 40's the next couple of nights! 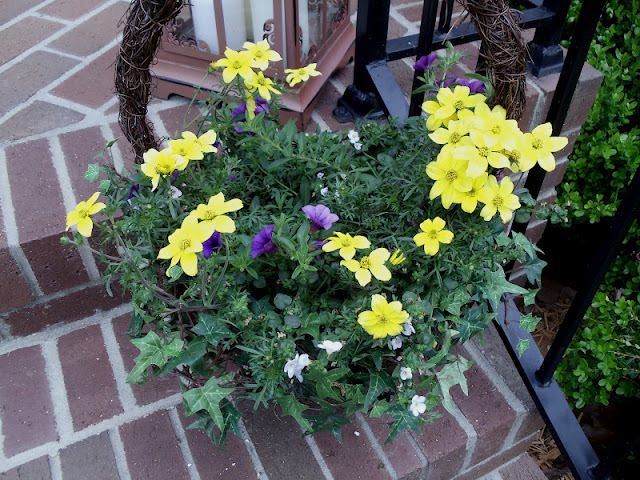 Your spring baskets look fabulous, Babs. Your basket is stunning! I adore how you poked a few eggs in for the Easter Holiday! So inspirational! You've made a great work with that decoration, it looks great. The basket looks so sweet with the eggs. I don't usually decorate for Easter anymore, but both my kids are coming home from college, so I did a little this year -- it mostly involves chocolate! You're much further ahead than I am! I just don't know what happened to me this year. My mind went totally blank!!! 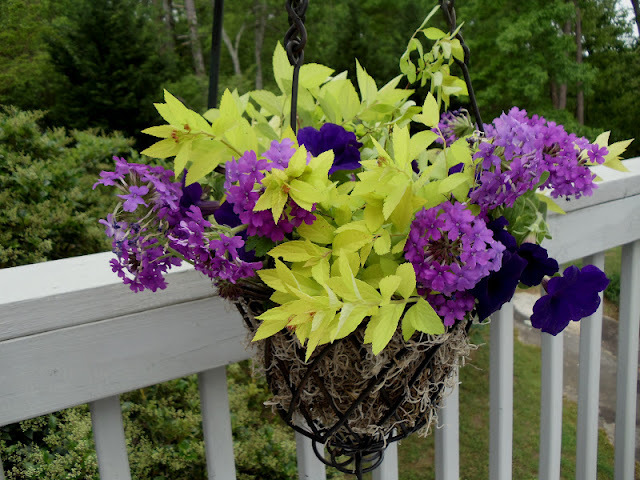 Your baskets are beautiful, and I'm glad that they were of the no-muss, no-fuss variety. You can enjoy them more that way! Your menu sounds wonderful, too! 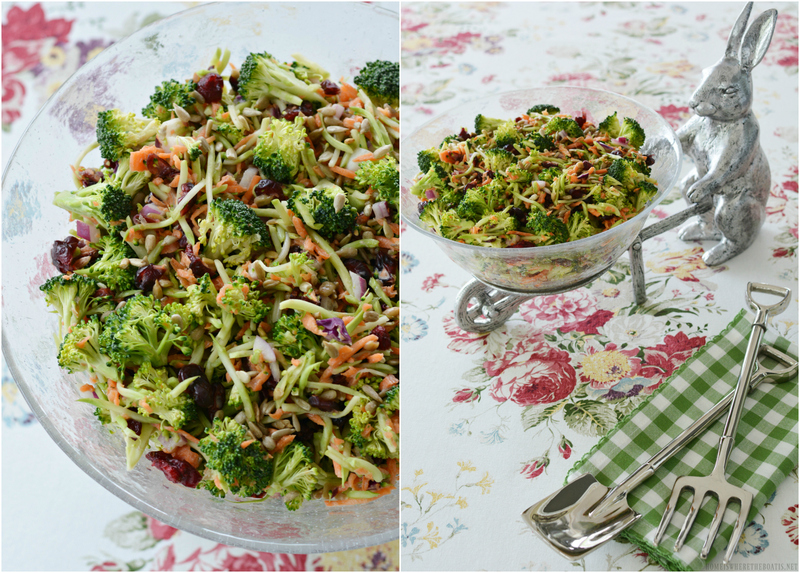 At this point we're lookin' at a bowl of Rice Krispies with a side of canned mushrooms for Easter dinner. I haven't bought a thing! Enjoy your weekend, Babs! Beautiful Babs!! Happy Easter to you! Happy Easter from my Blog to Yours. have a beautiful Day. Richard from My Old Historic House. Strange spring. It was 57 here today. Go figure. That was one quick and beautiful change. Love that you used the ivy wreath. You are so clever. I think the lantern looks good. It blends with the brick on the deck. Blessings for a joyful Easter. Hi Babs! Oh, your Easter floral basket is gorgeous! You are the most creative one! I wish you and your family a blessed Easter. Love the way you quickly incorporated fresh flowers into your outdoor space. Both simple, doable and elegant ideas. Thanks for sharing! Fantastic! I love that basket with the eggs! Thank you for joining me at Home Sweet Home!